Let's go down to Tiny Talisker Town. 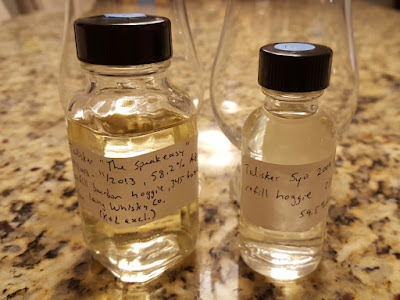 Long time readers may remember that I have reviewed The Speakeasy Talisker before. I've grumped a number of times about indie bottlers rushing to bottle immature whiskies, but I found the five year old Speakeasy to be quite good. So I decided to give another try, alongside the next baby Talisker cask selected by K&L, a 5yo 2009 from the Hepburn's Choice label. Its color is a very light amber. The nose begins with mezcal, lemons, oranges and wood ash. With some time it transitions to mint leaves, burnt barley and lemon cake. The palate is peppery as heck. Chili powder. Smoky cocoa powder. Lemon candy and clover honey. It finishes with honey pepper hot sauce, lemons and mossy peat. The nose gets very floral (blossoms, not perfume). There's a ham, honey, saltines and yeast. It fades pretty quickly though, leaving behind a single broad smoke note. The palate is sweet and spicy. Simple but balanced. Mezcal, barley and honey. The finish balances light sweetness, pepper and smoke, getting sweeter with time. It may have the lightest color I've ever seen on a whisky. It's almost clear. The nose is super vegetal with plastic and rubber band notes. But it also has molasses, mesquite chips, tequila and apricots. The palate has a spritely balance of veg, pepper and white fruit sweetness. Some mint and mossy smoke as well. Plenty of heat in the finish, along with peat smoke, black pepper, pretzels and charred veggies. The nose picks up some grilled meat notes, more moss and more rubber. It gets coastal and farmy too. The palate is minty, salty, peppery, sweet and charred. The finish is very peppery with lighter smoke and sweetness. Cigarette smoke. My opinion of The Speakeasy remains unchanged. It's a brash young whisky that will appeal to mezcal fans and peatheads. In addition to its fiery character, the whisky makes for a decent drink. It's one of the better low-oak super-young whiskies I've had. That being said, I'm glad I split this bottle with friends because I don't think I could have kept up the enthusiasm for an entire 750mL. The 2009 Hepburn's Choice comes across even rawer and younger than The Speakeasy. In fact its color gives a pretty good hint as to what one should expect. 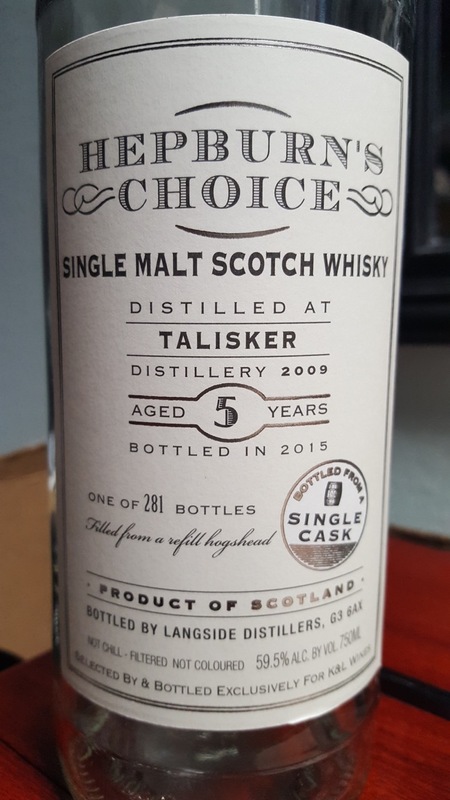 It's probably as close to Talisker new make as a non-Diageo employee will be able to try. Even though it blitzes the palate, it's less abusive than the 46%abv 6yo Ardmore I reviewed two weeks ago. And it's more complex and enjoyable, compared to that Ardmore. But, The Speakeasy wins the day here. It feels more like a mostly-complete product than immature spirit chosen for bottling because......well, I don't know why the 5yo cask was selected for a retailer by Langside. I don't understand why it couldn't have been left to cook for another 5-7 years. As referenced above, it's absolutely NOT bad whisky, but it still feels a bit like a stunt. Perhaps the hope was Speakeasy the Sequel. It's not, though it does provide a quick peek into Talisker's spirit. 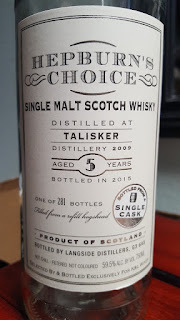 These releases really make me wonder how the Laings got their hands on Talisker spirit to begin with. By all accounts Diageo needed every drop, so there must have been a filling contract, but how did the Laings manage to get one at the point where demand was already ramping up? And why sell the casks now at relatively low prices when they could dump them into more active casks and make far more money five years down the road? Yeah, somehow they got the casks AND in some instances were able to use the distillery's name. Regarding your final question, I'm totally stumped on that too.